Most people, even if they aren’t taking a daily vitamin know that they should be taking one to improve their overall health. But how can you trust what’s inside the pills manufactured by conglomerates? Are these multivitamins really helping or hurting? One startup has emerged to that you can trust when it comes to your daily supplement intake – Ritual, by breaking it down into 9 essential ingredients. The daily vitamin company has done the unadulterated and unbiased research to create the most well crafted women’s vitamin for both the pregnant and non-pregnant woman and delivers it to your doorstep. 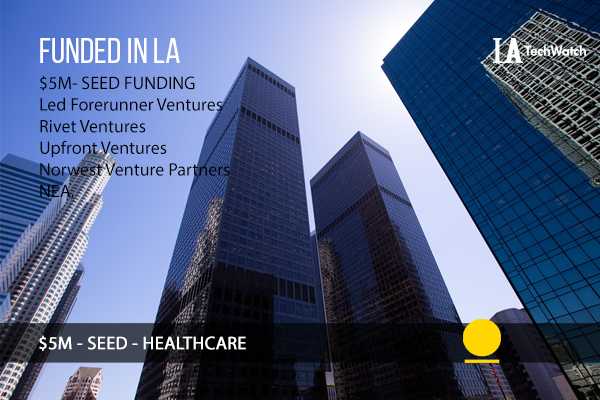 LA TechWatch chatted with CEO and founder Katerina Schneider about the newly funded startup and it’s future plans. In 2015, Ritual raised a $1.3M Angel from Founders Fund (FF Angel), Upfront Ventures, Rivet Ventures and Troy Carter. A few weeks prior to launch, we closed on a $3.5M Seed led by Forerunner with participation from Norwest and NEA, and reinvestment from Upfront Ventures and Rivet Ventures. Ritual is a new kind of health brand that believes in simplicity, traceability and ingredients that work best in the body. We have simplified the daily vitamin to its nine most essential nutrients, each in their most effective, vegan, non-GMO, gluten, soy and dairy-free forms. Ritual fills the gaps in a woman’s diet—helping round it out to reach total nutrition–with nothing more, nothing less. We source these nutrients straight from suppliers to combine the highest quality ingredients at a fair price, ordered direct-to-consumer at Ritual.com. When I was pregnant, I turned my house upside down to get rid of products with ingredients I couldn’t get behind. I replaced everything from my cleaning supplies to my deodorant. But, in my search for the perfect prenatal vitamin, I found many of those same questionable ingredients. I couldn’t find a brand that I trusted, so I decided to build my own. I founded Ritual with the belief that better health begins with better ingredients. Most consumers care about what they’re putting in their bodies, but when it comes to vitamins, they have no idea what’s inside. The supplement industry is plagued with skepticism and at Ritual, we’re completely flipping this idea on its head. We’re proud of the labs we work with and clear about how and where we source our ingredients. Through Ritual’s ingredient database, consumers are able to trace every ingredient back to its original source. Ritual is reinventing the daily vitamin in the $36B domestic supplement industry. Ritual delivers the highest quality ingredients at a fair price. Individually these ingredients would cost up to 5x, but by carefully controlling ingredient sourcing and selling direct-to-consumer, Ritual is able to cut costs and pass the value onto our customers. How did you go about determining the vitamins that consist of ‘only what you need’? Traditional multivitamins have not been redesigned in over half a century. Many traditional multivitamins contain well over 30 ingredients, most of which aren’t even necessary; as we already get enough through the foods we eat. To develop Essential for Women, our in-house team of scientists identified nine essential nutrients by applying the latest scientific government-funded data of what the average American woman is not getting enough of out of her diet alone. These ingredients are included in the most effective, cleanest forms, sourced from all over the world. I raised my first round of funding while I was 4 months pregnant. I was clearing out everything in my house with questionable ingredients from my deodorant to my toothpaste but when it came to my vitamins, I couldn’t find a brand I trusted, so I decided to build my own. I started raising money on an idea to transform a $36 billion domestic industry. The company had no revenue and the product hadn’t been created yet. Our angel investors backed us on the vision and the team behind the vision. Many investors asked if I could build a company and raise a child. I got a lot of questions like that. But I was extremely determined and knew I had to build this company because no one else was providing traceability in an industry that needed it the most. The initial challenge was staying focused. We could have gone into lots of products and categories with our approach of traceability. However, we decided to start with one product, EFW and build the best in class daily vitamin. That was a challenge and an opportunity. 1) Formulation: When we formulate our products we look at what we are missing from our diets alone. We don’t load consumers up with dozens of pills. For us simplicity is key. For our first product (Essential for Women), we identified the 9 most essential nutrients for women’s health backed by the latest data, then we sourced the most effective forms of those nutrients from all over the world that actually work in the body. 2) Traceability: For us traceability is transparency 2.0. On our site, we invite our customers to trace each and every ingredient back to its origin. We’re proud of the labs we work with and our fully traceable and transparent supply chain. And, for the first time, Ritual is showing consumers exactly where their ingredients come from and why. 3) Fair price: We designed our product and made it available for just a dollar a day. Bought individually, these ingredients would cost 5x more, but by having direct relationships with labs and suppliers and selling direct-to-consumer, we’re able to pass the value onto customers. For a monthly subscription of just $30, we’re delivering the hardest working, highest quality ingredients at a fair price. Right now, we’re hyper-focused on listening to our customers and building a strong community around the brand – the feedback so far has been tremendous! Just because raising money is challenging, doesn’t mean you don’t have a great idea and a product worth going to market with. If you don’t have a fresh injection of capital, stay focused and lean. Keep building, hustling and show product market fit. Do you prefer hiking or surfing in LA? I love living in LA because I’m a total outdoors person. I bike to work everyday and rarely use my car. In fact, my husband and I now only share one car. When my daughter was born I would hike Runyon with her every weekend strapped in one of those baby carriers. I love surfing and paddleboarding but hate wearing a wetsuit so I rarely go in LA.